State budget negotiations got underway this morning at the Governor&apos;s mansion. Legislative leaders and Governor Jim Doyle say they&apos;re optimistic about the budget talks leading to a compromise. 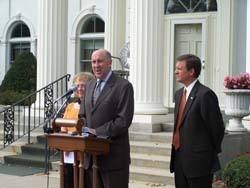 During a morning press conference at the Executive Residence, the Governor thanks Assembly Speaker Mike Huebsch (R-West Salem) and Senate Majority Leader Judy Robson (D-Beloit) for agreeing to attend the meetings. Doyle says their willingness shows they understand the budget is something that must get done. Speaker Huebsch says he&apos;ll work with Democrats, but expressed continued concerns about tax hikes in the budget. He says Republicans will give an honest effort, but there&apos;s a huge challenge to overcome in the tax levels included in the budget. However, Senate Majority Leader Judy Robson (D-Beloit) says they&apos;re goals remain clear to deliver a complete state budget. She says lawmakers have a responsibility to get the job done. The Governor and lawmakers have no specific agenda for the talks, but say they&apos;ll keep working to reach a budget agreement as quickly as possible.